Bukittinggi is a middle large city located on the west coast of Sumatra, Indonesia. The city received its name in 1949 when Indonesia became independent from the Netherlands. Previously it was called Fort de Kock and was originally established as an outpost of the Dutch colonial forces. After the Japanese surrendered in 1945, Soekarno and Hatta proclaimed the Independence of Indonesia on August 17 of the same year. 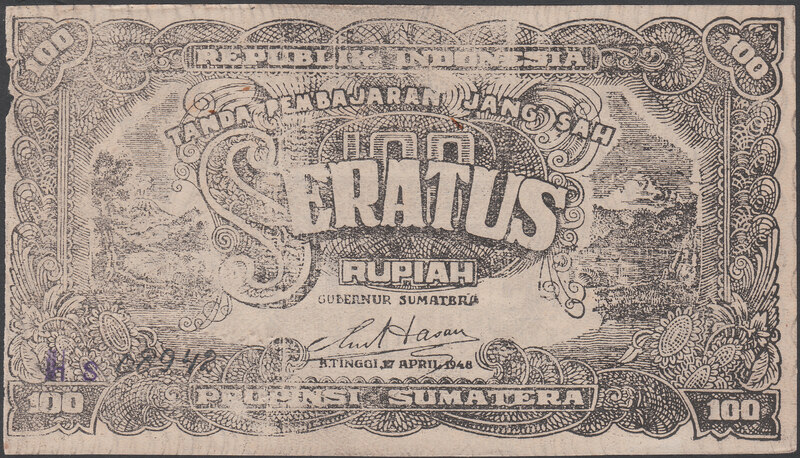 In order to support the revolution they started initiatives to issue Indonesian paper money throughout the territory. Since Indonesia officially remained a Dutch colony until December 1949, the Dutch tried to restore their rule after the Japanese surrender. In the period 1945 – 1949 Indonesia was divided in three area’s. One area where the Dutch were in control and issued their own NICA (Netherlands Indies Civil Administration) money. Another area where the Indonesian revolutionaries were in charge and started to issue their own ORI (Oeang Republik Indonesia) money in August 1946. There was a third area where also the newly proclaimed Indonesian government was in charge, however due to logistical problems could not issue their own ORI money. Teuku Mohammad (T.M.) Hasan was the Republican Governor of Sumatra. During the Darurat Cabinet of Sjafruddin Prawiranegara he was Minister of Education from 19 December 1948 – 13 July 1949. In his capacity as Governor he signed the URIPS (Uang Republik Indonesia Propinsi Sumatera) papermoney emission, dated 17 August 1947 and issued in Bukittinggi. Like the ORI (Oeang Republik Indonesia) money issued on Java, the URIPS money has a secret code hidden in the serial number. Since the URIPS money was printed using simple techniques, it was easy to falsify. Financial authorities created a fixed relation between the three characters of the serial number in order to easily identify forgeries. Obverse and reverse printed in brown (varying from pink brown to chocolate brown). The obverse has a green under print. The serial number is printed in red and consists of 5 numbers and 3 characters. The first and last character are always capitals and the middle character is always in lower-case. Obverse and reverse printed in red or brown (varying from red, red brown to chocolate brown). The obverse has a green under print. The serial number is printed in black and consists of 5 numbers and 3 characters. The first and last character are always capitals and the middle character is always in lower-case. Obverse and reverse printed in brown (varying from light brown to chocolate brown). The obverse has a brown under print. Obverse and reverse printed in blue (varying from light blue to dark blue). The obverse has a blue under print. Obverse and reverse printed in green (varying from light green to dark green). The obverse has a red under print.